The island of Kizhi may be best known for its log churches, but the site also has prime examples of traditional Russian log homes. Kizhi Island is one of Russia's best-known heritage sites, visited throughout the year, but especially in the summer as part of river cruise itineraries between St. Petersburg and Moscow. Located on the northwestern shore of Lake Onega, in the Republic of Karelia, Kizhi displays the wooden structures that define the traditional culture of the Russian north. There are other sites with a similar mission, such as Semyonkovo near Vologda. 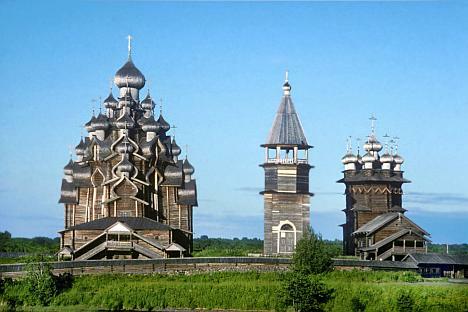 Kizhi, however, is unique in the range and distinction of its collection, from simple barns to the towering log Church of the Transfiguration of the Savior, with its 22 cupolas. In the late 1940s, substantial restoration work began on Kizhi, and in 1951 the first example of historic log structures from other Karelian locations was brought to the island. New additions arrived throughout the 1950s and 1950s, and in 1966, Kizhi became a national architecture and historic museum; it was designated a UNESCO World Heritage Site in 1990. The Transfiguration Church, built in 1714 and located with the companion Church of the Intercession on its original site, is for many visitors the defining monument of Kizhi. It is complemented by half a dozen other log churches and chapels scattered throughout the island at carefully selected points. Indeed, the small, archaic Church of the Resurrection of Lazarus, built perhaps as early as the end of the 14th century, is one of the oldest surviving Russian log buildings. For all the lyrical beauty of these log churches, the basic purpose of building in wood was to provide housing. Like the wooden churches in their midst, the log houses of Kizhi demonstrate artistry of design as well as economy of function. Built primarily of pine or fir, with birch and aspen for details, the log house (izba in Russian) was crafted to withstand the severe climate and long winters. Examples of these houses, primarily from the late 19th century, are spread throughout Kizhi Island, from buildings grouped around the original church ensemble at the lower end of the island to other sites at the island's middle and northern parts. Taken together, these sites exhibit structures from various districts throughout the northwest region of Lake Onega, including villages inhabited by ethnic Karelians and Veps. The island also has two villages of its own – Vasilyevo and Yamka – which feature log houses whose traditional design complements those reassembled at the museum. In the severe climate of the far north, these houses provided living space for people as well as space for animals, supplies, and farm implements within a single, self-sufficient structure. Such northern houses varied considerably in size and configuration. On display at Kizhi are three basic types, each with its own name. The simplest in plan is the brus, a long rectangular structure whose living quarters are at the front, while the larger space for storage and livestock extends along a single axis to the back. The front facade is framed by the two slopes of the roof, often with a balcony for a summer room under the peak of the roof. On the side are covered steps leading to the main floor. An impressive example in the south part of Kizhi is the Sergeev house. Even larger is the Moshnikova house in the middle of the island. In the barns contained within these houses, livestock occupied the lower level, while hay and other supplies were kept on the second floor. The most complex type of house design on display at Kizhi is the koshel, a two-story structure whose living quarters are underneath the long horizontal front of the main roof. In back of the living quarters was a barn under a greatly extended roof that originates from the same roof beam over the living quarters. When seen from the side, the barn looks like a large appendage extending from the house. (The basic meaning of koshel is "purse".) The Oshevnev house, near the Church of the Transfiguration, is a particularly good example. Houses with this design occasionally had a gabled half story with balcony in the center of the front roof. An excellent example is the enormous Sergin house, now at the village of Vasilyevo on the western side of the Island. The least frequent type of house plan on display at Kizhi is the glagol, whose name is derived from the archaic Russian name for the Greek letter "gamma." This type consists of a rectangular structure with the barn attached to the side and extending back at a right angle (the top of the "gamma"). The Yelizarov house, on the south part of the island, shows a combination of the koshel and glagol designs. The center of the peasant log house – whatever its size – was the large brick stove, used not only for cooking but also for heating the main living space during the long winters. The stoves usually had a ledge along the side on which a pallet could be placed for those who needed extra warmth, such as the elderly. Large houses had a separate bedroom for the head of the household. Children could be accommodated on ledges in the main room, while a young married couple living with the family might have a separate space of their own. Larger houses could also have summer quarters that were not as well heated. Whether large or small, the exteriors of these log houses were traditionally decorated with elaborate window surrounds (nalichniki) and carved decorative endboards (prichelina) for the roof. In the 18th and 19th centuries, patterns derived from folk art became particularly elaborate. Yet during the same period, carpenters began to adapt urban architectural motifs such as baroque window surrounds that they observed during seasonal work in cities such as St. Petersburg. The larger houses displayed on Kizhi serve as a showcase for artisanal skills that reflected the owner's wealth and culture. The rigors of the northern climate produced a shelter environment that excluded or reduced natural light – even in the limited, precious time when the sun was visible. The windows were small, and whatever interior lamps existed were dim. All the more comprehensible then was the urge to create vivid forms that would catch and reflect the light, whether the tower and cupolas of a church or the decorative wooden carvings on the facade of a log house. Such forms, created from the materials available in the northern forests and gathered at Kizhi, reaffirmed the survival of the community and the innate longings of the soul.